This work (Grand Ball given by the Whales), identified by The British Library, is free of known copyright restrictions. There was a certain amount of spluttering over the porridge this morning, as the Today programme's John Humphrys discussed reports of discovery of whale vomit on a Morecambe beach, and speculated briefly on the possibility of somehow farming sperm whales for this valuable commodity, more pleasantly also known as ambergris. Long-sought-after for its rarity and use as a base for perfumes, this lump of grey waxy emission is a reminder of the special status of whales and their relationship to human culture. 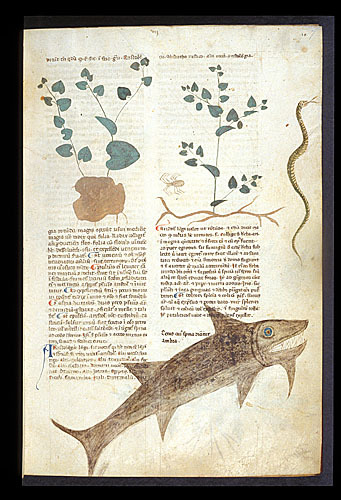 Egerton 747, f. 7, 'Birthwort and Ambergris'. Guidance on use of this image. But a more recent - and American - reminder can be found in the cartoon at the top of this post, taken from Vanity Fair in 1861, and which we hold at the Library. 'The Grand Ball given by the Whales' depicts a celebratory pod of whales, who are heartily cheered by the the striking of 'rock oil' at Drake's oil well in Pennsylvania. No longer, the sperm whales believed, would their precious spermaceti oil be hunted for use in candles and lubrication of the delicate machines of the industrialised north. It tool a while for oil to become established as lighting and heating fuel and a propellant, but against the backdrop of the Civil War, a startling, and massive, infrastructure was put in place (extraction, refinement, distribution, sales...), and the American talent for marketing was put to work inventing and explaining how the new fuel could offer brilliant light for homes, offices and factories. At one point, U.S. consuls were provided with details of newly-designed kerosene lamps and instructed to advertise them in the capitals of the world. Oil tankers were invented, removing the need to rely on leaky oil barrels (which stripped the poor horses that pulled them in carts of their hair), naval engineers began to speculate on converting warships to petroleum, rather than relying on great coal stations, and vast new docks and sumps were constructed. Legislation had to be passed in both countries after a series of fires at oil merchants and their warehouses (there was also a relatively well-founded scare about the inflammatory properties of oil lamps). And, unlike the potential olfactory use of ambergris, all of this smelled pretty bad.